Tired of your old armour? Feeling brave? Then this event is for you. Armour, battle and martial pieces (but no weapons!) are available at the Event NPC. You buy the armour as +0, and if you manage to upgrade your piece to +13 within seven days it becomes permanent! But be careful! If by day 7 your armour piece has not reached +13 it will vanish. 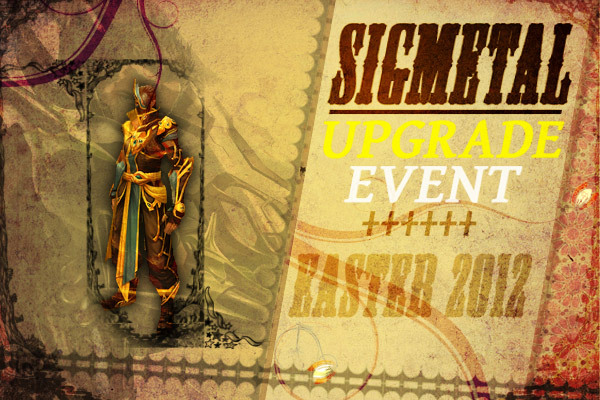 So calculate your chances, and if you feel brave pick up one of these shiny SIGMetal pieces during this Easter. Armour on sale will include all parts (boots, gloves, suits) with 8% (not a typo, 8%) Skill Amp, either Sword or Magic, and helms with 16% Critical Damage increase. [EU] [Cash Shop] Safeguards return !